Ice sheets are massive land-based reservoirs of frozen water. For the first time, scientists have reconstructed in detail the evolution of the last ice sheet that covered Iceland around 20,000 years ago. The recently published study shows the greatest changes took place at a time when temperatures in the Northern Hemisphere rose by around 3°C in just 500 years. The maximum rate of ice loss in Iceland then was on the same scale seen in West Antarctica and Greenland today, providing worrying evidence of how climate change can dramatically alter the world's ice sheets, leading to rapid sea level rise. 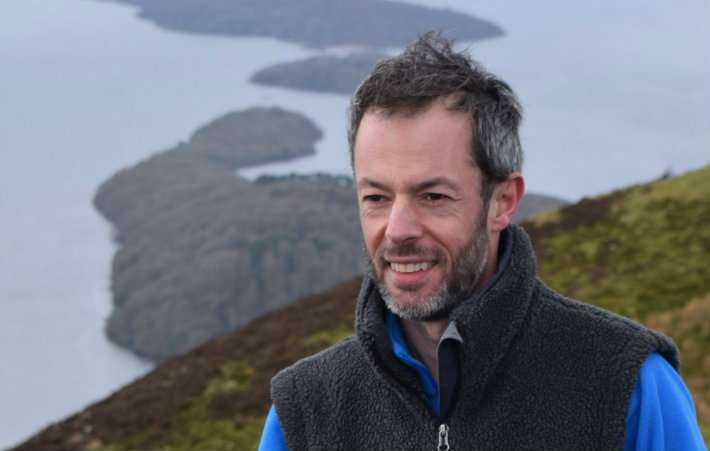 Dr Tom Bradwell, from Stirling's Faculty of Natural Sciences, said: "About 22,000 years ago, the climate awoke from the last Ice Age, and entered a prolonged but gradual period of warming. This triggered the melting of the huge ice sheets that once covered North America and Eurasia. "We used seafloor data to map the full extent of the last Icelandic ice sheet and fed this geological information into our ice sheet model. The new modelling experiments, driven by climate data from Greenland ice cores, replicate ice sheet behaviour over the last 35,000 years, showing when it melted the fastest and how it behaved. "We found that, at certain times, the Icelandic ice sheet retreated at an exceptionally fast rate – more than double the present-day rate of ice loss from the much larger West Antarctic ice sheet – causing global sea level to rise significantly." 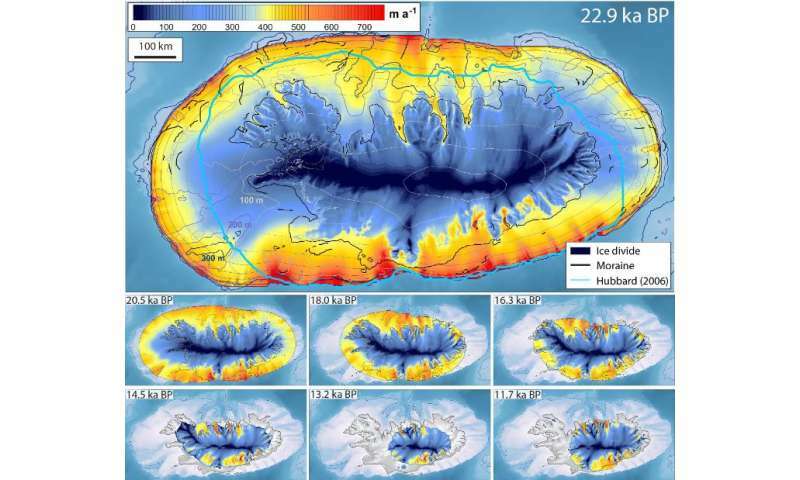 These high-resolution model experiments, published in Earth-Science Reviews, provide an unprecedented view of how the Icelandic ice sheet rapidly reduced in size and volume between 21,000 and 18,000 years ago, mainly through icebergs breaking away from its marine margins. It then collapsed 14,000 years ago, this time abruptly in response to rapid climate warming. The Icelandic ice sheet reached a maximum size of 562,000 sq. km – an area about the size of France. During its dramatic collapse the ice sheet melted rapidly over much of its surface area, decreasing in size by almost two-thirds, in only 750 years. This large volume of ice melting caused a 46 cm-rise in global sea levels – or more than 1mm rise every two years for over seven centuries – and is equivalent to the ice losses currently being experienced in Greenland. When compared to the length of time it took the Icelandic ice sheet to grow to its full size – approximately 10,000 years – this rate of change is all the more remarkable. These abrupt events, seen in former ice sheets and mirrored today, put present-day rates of ice sheet change in a new perspective. However, until recently, much of the data needed to reconstruct and model their shape, size and flow existed unseen below sea level. Dr Henry Patton, from UiT The Arctic University of Norway, said: "Satellite data show that the present polar ice sheets can respond on alarmingly short timescales to climate and ocean changes. By using data from the geological record to constrain model reconstructions of rapid ice sheet change thousands of years ago, we can better predict how contemporary ice sheets will probably react in the future and the serious impact they have on sea level rise." Prof Alun Hubbard, who works at UiT Norway and Aberystwyth University, said: "Just like the Icelandic ice sheet, some 20,000 year ago, the retreat of the Greenland ice sheet is now contributing up to approximately 1.2 mm per year to global sea-level rise. That doesn't sound much but given the time-scales involved, and that Greenland's ice loss has increased from nothing 20 years ago to over roughly 350 cubic per year now, makes it a significant cause for concern – particularly for those low lying, coastal regions where much of the planet's population lives."